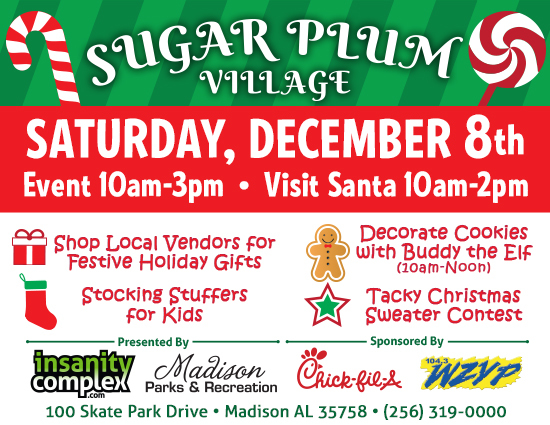 Insanity Complex and Madison Parks and Recreation are excited to announce the second annual Sugar Plum Village. There will be vendors at this event selling local and handmade products, which will be PERFECT for any last minute Christmas shopping you need to get done. This is also a family friendly Christmas themed event centered happening on Saturday, December 8th from 10AM-3PM. There will be cookie decorating, Christmas tree ornament decorating, and an ugly sweater contest! Attention Local Businesses: Sign Up to be a Vendor (Booths are Free at Sugar Plum Village). Call 256-319-0000 ext. 1026 or ext. 1029 if you’d like to be a vendor.